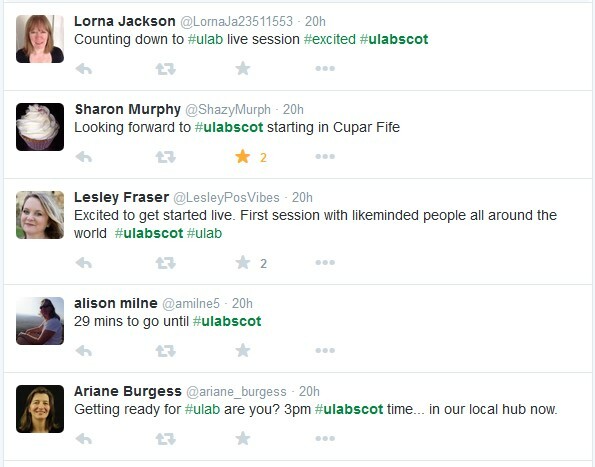 Yesterday, many of us tuned in for the first live session of U.Lab alongside many, many other from across the world. This international dimension was really powerful for me. I was in a room with over thirty colleagues and the experience I had with that group was a mix of intrigue and peace (during the moment of stillness you could have heard a pin drop – I’ve never experienced that before at work!). And then the spontaneous cheer when Scotland was mentioned! To date, we have over 1,300 people signed up to U.Lab Scotland and over 800 of them are in Scotland. There were a few technical problems which caused the feed to stutter a bit towards the end but the recording is much smoother and can be viewed here (at 1:14 Scotland is given as a great example of what’s possible as a community of change makers). The next live session is on Thur 8 Oct at 3pm (BST). Course materials for this first week are now available on edX. This is the most intensive week of the course but stick with it! 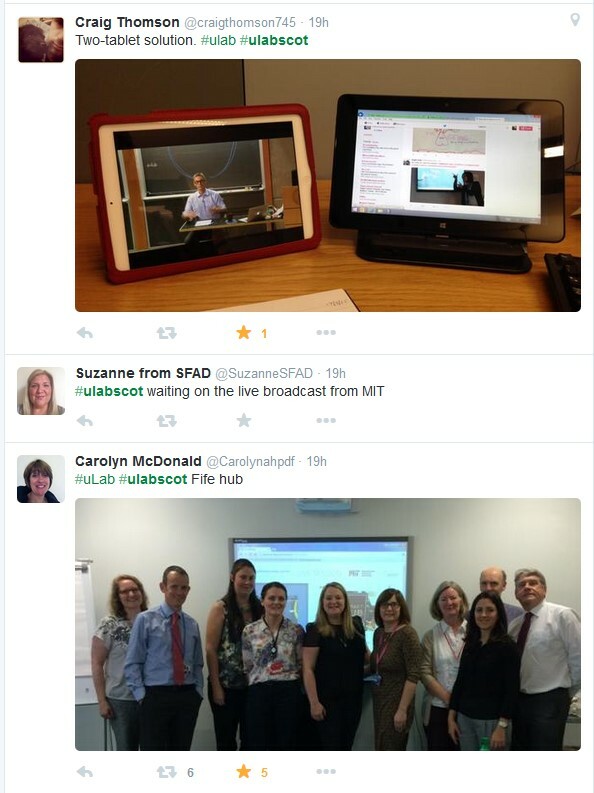 Because of this, we have kept the U.Lab Scotland content super light. At the time of writing this, we’re experiencing some technical problems with many people not being able to see them. Don’t panic! We’re on it and hope to get it fixed soon. This week, you are also introduced to coaching circles. This is a small group of people who meet either in person or virtually (through Skype etc) and take it in turns to present a leadership challenge they are facing and for all to practice the skills we learn through the course. U.Lab provides the framework on how to do it so the main thing this week is to find a group, should you wish to participate in this way. I found this one of the most surprisingly effective parts of U.Lab last time as it gave me some insights I hadn’t made in other forms of peer support I’ve tried. 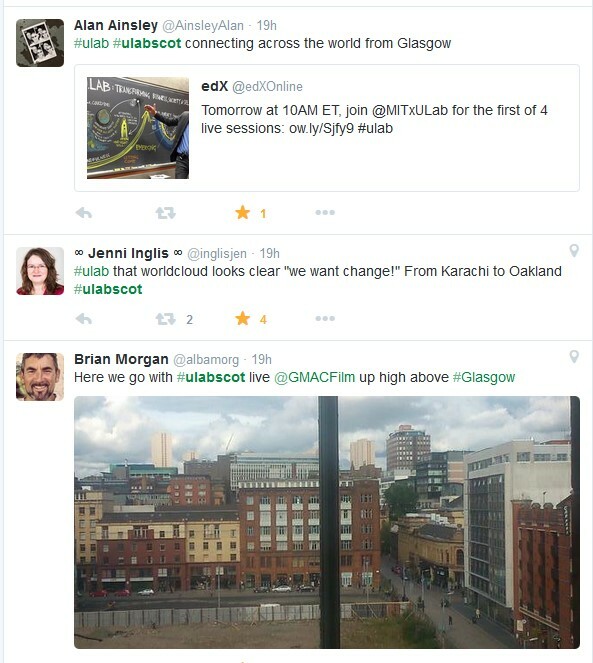 Enjoy your week and please continue to share your thoughts, photos, videos on Twitter (#ulabscot #ulab) Facebook. and in our Scotland Hub on the Presencing Institute website.